Since last year’s Meatless March experiment was such a success (or maybe I’m just trying to torture myself), I’ve decided to embark upon the adventure once again. It was a lot of fun trying different meatless burgers around town. They totally made me rethink the stereotype of a veggie burger being a boring, bland, dry-looking circle of fake meat. There were veggie-infused patties in all sizes, shapes and colors. 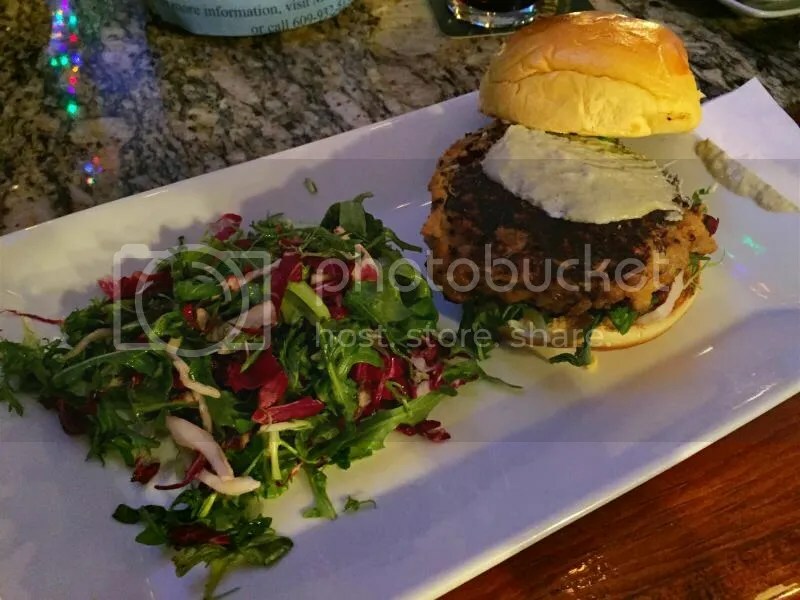 Kicking things off this month is the “Bonzo Burger” at Taproom on 19th – a veggie patty consisting of Garbanzo beans, black quinoa, feta & cumin topped with cilantro yogurt on a Conshohocken Bakery roll. The patty came with a char on the outside, reminiscent of your favorite backyard burger minus that burnt meat smell. The overall flavor of the burger was great but I felt that the texture of the patty itself was a little too soft, especially paired with the super soft bun. I added some of my salad to the top of the burger to give it a better mouth feel & add a little bit of crunch. It’s definitely worth checking out – especially on Monday nights when all burgers are 1/2 price! NB: Just like last year, I won’t be doing individual ratings for the veggie burgers. At the end of the month I’ll do a recap of all the burgers I tried and let you know which one was my favorite! So be sure to tell all your veggie/herbivore or Lent following friends to check this series out! Posted in Bonzo, cilantro, cumin, garbanzo beans, Meatless March, salad, Taproom on 19th, veggie burgers, veggies. Bookmark the permalink.